Part of my work involves teaching others how to podcast and when it comes to video my advice always is STOP! and LOOK! first before you consider ever creating your own videos. You can spend a lot of time creating videos — I know I spend way too much time creating videos for my podcast site. There is sooooo much content already on the Internet that it is often more efficient to use videos created by others. Google Video search results now include videos on lots of other video hosting services (e.g. MySpace, Yahoo!Video), in addition to YouTube’s and their own uploads. This is faster than searching all the video sharing and hosting websites. While Google owns YouTube you will obtain different search results when you search both sites using the same search term and YouTube only includes their own uploads i.e. YouTube videos. Also videos on Google Video have not time restriction whereas YouTube videos are restricted to less than 10 minutes. Most of their videos can be downloaded in a range of formats i.e. suitable for an ipod, PSP or mobile phone. However you need to create an account to download their videos. Thanks Joe for reminding me that VideoJug has videos on “how-to-use” applications such as PowerPoint, create podcasts, use twitter …. check out the list of videos at the bottom of Joe’s post on How to Create a Talking Book. I normally demonstrate their videos using How To A Homie Handshake because everyone has a great laugh. sharing sites make it hard to download videos. Also Google Video and YouTube videos are .flv format which means you need to convert to a format suitable to play when downloaded. 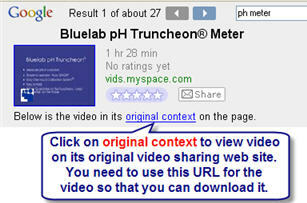 NOTE: To download a video you locate on Google Video you need to view the video on its original video sharing web site. Zamzar is a free online converter that will convert image formats, document formats (e.g. Word, PDF), music formats, video formats (refer to this page for more information on file format). Once you have located a suitable video you copy the URL of the video and paste it into the URL text box at zamzar.com then press add URL. Now select your video format (choose .avi for PDAs and PCs, mp4 for ipods). Next insert your email address and press convert. You will receive an email within 30 minutes the link to the converted stored at Zamzar and you have 24 hours to download the video (Thanks Darren — you were right). Sites like Google Video and YouTube use .FLV format for their videos. Online FLV converters are able to download and convert videos into a range of video formats. Once the file is converted you then download from their website. vConvert.net will convert FLV to formats such as wmv, mov, mp4, mp3, 3gp. Suz recommends vConvert.net because it is a much more reliable flv converter than Vixy which she has found would frequently corrupt a file on longer videos (thanks Suz). Definite benefit is this site provides more conversion options than Vixy but you will need to create an account to use. Vixy is a free online FLV converter (i.e. this is the video format used by many video sharing web sites) that you can use for downloading and converting videos for PC, ipod and PSP. Once the file is converted you then download from their website. Here are the instructions on how use KeepVid and Super C (this is the last resort option because more steps involved). I use Super C all the time for video conversions however it does take time to get used to using. Would love to hear about your experience with videos. What is your favorite video sharing web site(s) for locating videos? Have you got any tips for downloading videos? Where do you like to host your own videos? For finding videos, I strongly recommend Miro (http://www.getmiro.com/) as it allows you to easily search Google, You Tube and a range of other video sharing websites and download them to your computer. Darn, 2 out of 3 posts spam? How frustrating. Just wanted to point out http://www.vconvert.at/ its a much more reliable flv converter than vixy (which I found would frequently corrupt a file on longer videos). Lots of great info in this post – Ill be following all the links when I have more time. Thanks! Thanks Kate will road test Miro on my computer. Unfortunately we would not be allowed to use it at work. Suz – thanks for sharing your tips on video with me. I have made changes to the post based on your comment and it also made me realise I needed to point out they need to find the original video site for videos found on Google Video. Yes I am getting totally sick of spam blogs but it is such a problem I not sure what I shall do — totally overwhelming on my podcast site. Weird this. Put your name and not mine in the Name box. !! Great post Sue. Gotta say I have found Vixy.net to be excellent, and many of my teachers use it too without any problems. I wonder if suz problem is a network timeout issue? I also love your little instructional images – what are you using to generate those? Mmmm Kate – I think this has been happening if I don’t log out. Sorry. Thanks Judy – SnagIT is my secret (not that secret) and it just makes it easier for everyone. Most of my participants prefer step by step handouts which is why I use these. I found Vixy easy but prefer the increased video options offered by vConvert.